South Africa is a vibrant country made up of an eclectic mix of different cultures and backgrounds, with the influences of the African tribes including the fearsome warriors of the Zulu nation. All these different cultures come together in the pots and pans of the kitchens of South Africa, where interesting and delicious dishes can be found bubbling and boiling away with flavours to make any traveller’s taste buds tingle. So grab your essential travel tools and make your way to the tip of Africa for tasty treats you won’t forget. A South African barbecue is called a ‘braai’ – it is completely different from any barbecue you may experience anywhere else in the world. The premier two components of any successful braai are a type of corn porridge called ‘Pap’ and a long curly sausage made of spiced meat and special ingredients rarely shared with an outsider, called ‘boerewors’. A braai is an excellent past-time which all South Africans, regardless of age, creed or race, enjoy. It is also a fantastic reason for a late night party outdoors that often lasts long into the African night. To experience the real braai culture, head to a place called Mzoli’s in the beautiful city of Cape Town where the friendly locals are always happy to share a drink with you and teach you the art-form needed to expertly braai your boerewors. For the truly adventurous traveller, the dish you simply must try in South Africa is Mopane Worms and tomato relish. Actually a caterpillar, the Mopane worm itself is rather tasteless, but it is the manner in which it is prepared which gives it its unique flavour. The most popular way is to boil them in salty water and then quickly fry them which gives them a crispy crunch with a soft and chewy centre. This is not a dish for the faint-hearted, but it’s a delicious dish with a difference and can be enjoyed in a number of African restaurants throughout South Africa. Not actually containing any bunny rabbit at all, the bunny chow is a delicious meal found particularly on the east coast of South Africa in the city of Durban. During the gold rush in the late 1800’s, many different cultures across the British colonies converged in South Africa. The city of Durban brought an influx of Indians where the spices of India easily grew in the tropical climate of the region. The bunny chow is the product of this cultural melange: half a loaf of bread with the inner white part of the loaf scooped out and replaced by a deliciously spicy curry. The best part of this unique dish is that there are in fact no dishes used – the bread acts as your bowl. 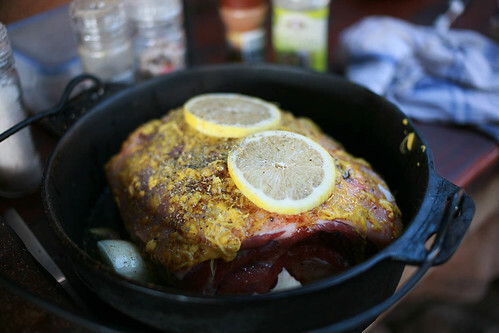 For the traveller who loves their Sunday roasts, try a South African lamb potjie in the Karoo region of the country. More a stew than a roast, this dish is tastier than any roast. A potjie is a small three-legged pot which is placed over an open fire with a rainbow of ingredients to flavour the main part of the dish – the lamb. Grown naturally in the tough environment of the Karoo which resembles a desert, Karoo lamb is world renowned for its gamier flavour than other lamb. Definitely bound to become one of your firm favourites, you cannot leave South Africa without having tried a Karoo lamb potjie. One of the best ways to see South Africa is by car. Driving, you will manage to see and stop at all the farm stalls found dotted along the country’s highways. When you stop at one of these small, family-owned stores, you are bound to be able to find a delicious delicacy called a koeksister. This delicious sweet cake is similar to a doughnut, but it is twisted or braided and smothered in a very sweet sugar-syrup. It is made by braiding the dough, deep-frying it in oil and then quickly dipping it in the cold sugar-syrup. Koeksisters are at their tastiest when they are cold and are a sticky crunchy treat to enjoy on long road-trips. Today’s guest writer is Matthew Wilkes, a travel-writer and social net-worker for EssentialTravel.co.uk. with a keen interest in the way the world works. His anthropological interests have seen him travel to many different countries, collecting interesting friends and memories. Next articleWhere did I put my Golden Phoenix? That creepy crawlies makes me shiver to the bones! 😀 I hope to visit South Africa some day. A beautiful country. Obviously, would stay away from those crawlies! Ewww!! The Karoo lamb sounds good, won’t mind trying it! The worms creeps me. No matter how fried or delicious it may look. I don’t think I’m able to eat it .